A/Prof Helen Boon teaches educational psychology and behaviour management at James Cook University. Helen has a strong research interest in climate change and the intersection of ethics, climate change and adaptation to climate change, as well as community resilience to disasters. Helen’s preferred research methods include structural equation and Rasch modelling. She has led interdisciplinary and ARC funded projects with partners from Medicine, Public Health, and Environmental Sciences..
A/Prof Helen Boon teaches educational psychology, special needs and behaviour management at James Cook University. After initial training in Chemistry and Physiology Helen obtained a doctorate in educational psychology. Helen has a strong research interest in climate change and the intersection of ethics, climate change and adaptation to climate change, as well as community resilience to disasters. Helen’s preferred research methods include structural equation and Rasch modelling. She has led interdisciplinary and ARC funded projects with partners from Medicine, Public Health, and Environmental Sciences in resilience to disaster and ethics. Recent publications include Recovery from Disaster: resilience, adaptability and perceptions of climate change. 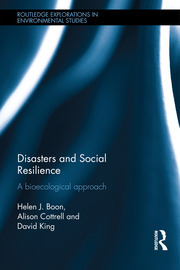 Published by the National Climate Change Adaptation Research Facility, Gold Coast and Disasters and Social Resilience: a bioecological approach, published by Routledge. Helen is currently working on a Canadian funded ethics project. My preferred research methods as quantitative, including structural equation modelling and Rasch analysis as well as mixed methods using narrative analysis. Neuroscience, climate change, ethics and community resilience.